A family dog in Australia survived the harrowing ordeal of swallowing six baggies of heroin. According to an April 6 report by the Daily Mail, a cocker spaniel on a walk with its owner at a park in Brompton, Australia, picked up the bag of drugs off the ground and swallowed it. After becoming sick, the dog was treated with medication and—eventually—surgery. Shelby, a 16-month-old cocker spaniel, was out for a walk in the park with owner Denis Parslow, according to the Daily Mail report. Parslow told the news outlet he noticed Shelby had picked up a large plastic bag off the ground. “He had something in his mouth which was quite large so I challenged him and he swallowed it,” Parslow told the publication. The owner recounted how the dog became less active than usual, and later began to vomit. He took Shelby to a veterinarian, who first gave the dog antibiotics for a suspected gastrointestinal infection. The symptoms got worse, however, and Shelby was taken back to the vet for another consultation. An x-ray revealed the disturbing cause of the dog’s persistent malady. “He’d actually swallowed this plastic bag full of balloons of heroin, we were in a real state of shock at the time,” Parlow told Australia’s 7News. Parslow said the veterinarian gave the dog Narcan—a medication normally administered to people suffering from a heroin overdose. The bag of drugs was inside the dog for five days, the owner told Daily Mail, before it was decided to remove it through surgery. Shelby’s treatment ended up costing the family around $2,800, according to 7News. The owner said that to his knowledge no other dog had ever encountered anything like Shelby had, and the beloved family dog was lucky to be alive. Police have seized the heroin stash and are investigating its origin, according to LAD Bible. “When the police saw him, they thought he looked very much unlike a drug mule or a suspect,” said Parslow, according to the report. Authorities in Australia said anyone who finds illicit substances should contact the police immediately. “You should not touch or move the drugs,” the NSW Police Force said. Meanwhile, according to a recent report by the National Safety Council (NSC), accidental opioid overdose has surpassed motor vehicle accidents as the leading cause of unintentional deaths in the United States. Americans have a 1 in 96 chance of dying from an opioid overdose, while the probability of dying in a motor vehicle accident is 1 in 103. The council’s analysis is based on 2017 mortality data by the National Center for Health Statistics, which is part of the Centers for Disease Control and Prevention (CDC). “The nation’s opioid crisis is fueling the Council’s grim probabilities, and that crisis is worsening with an influx of illicit fentanyl,” the NSC said in a statement on Jan. 14. According to the National Institute on Drug Abuse (NIDA), more than 130 people in the United States die of an opioid overdose each day, while the cost of prescription opioid misuse in the country is $78.5 billion a year. This includes the costs of healthcare, lost productivity, addiction treatment, and criminal justice involvement. 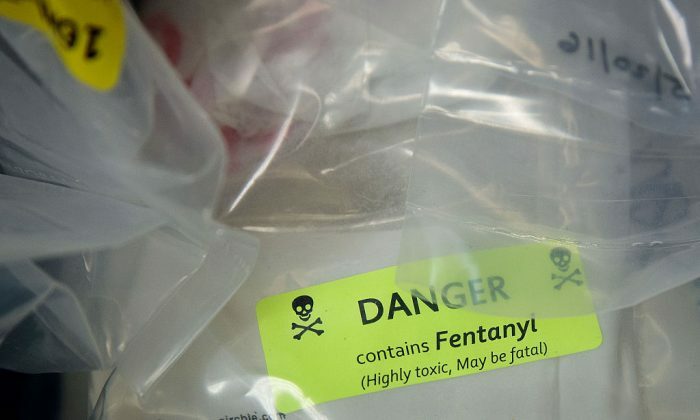 Fentanyl, a synthetic opioid pain reliever 50 to 100 times more potent than morphine, surpassed heroin to become the most common drug linked to an overdose death in 2016, according to the CDC (pdf). Two milligrams of fentanyl is a lethal dose for a nonopioid user. Epoch Times reporter Janita Kan contributed to this report.